Fred Katz of The Athletic speaks on the upcoming gluteal surgery for Dwight Howard and John Wall's contract being a detractor for possible suitors. Is Dwight headed to Springfield? The Starters discuss. Count down Friday's top ten plays from the NBA. Spencer Dinwiddie lifts the Nets to a 115-104 win over the Wizards, scoring 25 points and dishing out eight assists. Bradley Beal lifted the Wizards over the Cavaliers, 119-95, with 20 points and 3 steals. Collin Sexton scored 24 points for Cleveland in the loss. John Walls drops 25 points and 10 assists in a win against the Magic 117-109. John Wall leads all scorers with 28 points and dishes out nine assists as the Wizards beat the Heat, 116-110. Luka Doncic puts up 23 points, Harrison Barnes adds a double-double with 19 points and 13 rebounds as the Mavericks beat the Wizards, 119-100. John Wall records 26 points and seven assists, Bradley Beal adds 22 points as the Wizards snap their 5-game losing streak with a win over the Knicks. Check out this highlight of Dwight Howard's debut in Washington as a Wizard. Russell Westbrook puts up a double-double with 23 points and dishes out 12 assists to put the Thunder over the Wizards, 134-111. Has missed ten games this season (3/17/14-3/22/14; 3/29/14- 4/8/14) with a left ankle strain … placed on inactive list for two games (4/9/14-4/11/14) … named a as reserves for the 2014 NBA All-Star Game, which marked the eighth time in his career to be selected an All- Star … posted eight points (4-6 FG), a game-high 11 rebounds and three assists in 13:17 of action in the 2014 NBA All-Star Game in New Orleans (2/16/14) … made his Rockets regular season debut by posting 17 points (8-14 FG), 26 boards (20 defensive) and two blocks vs. Charlotte (10/30/13), equaling his career high of 26 rebounds done twice before (26 on 4/15/06 vs. Philadelphia and 26 on 1/6/13 vs. Denver) … totaled 18 points (7-12 FG), 24 rebounds and five blocked shots vs. Toronto (11/11/13), including 17 points (7-11 FG), 11 boards and three blocks in the first half alone … netted 25 points (4-6 FG) off a 17-of-24 (.708) night from the free throw line vs. Denver (11/16/13), scoring 18 of his 25 points in the fourth quarter by going 14-of-20 from the stripe … made his first 11 shots of the game and posted 33 points (12-16 FG, 9-13 FT) to go along with 11 boards at Dallas (11/20/13) … tied his career high for most consecutive field goals made to start a game (11-11 FG on 2/24/10 at Houston) … had 15 points (7-9 FT) and 18 rebounds (8 offensive) vs. Phoenix (12/4/13) … added 22 points (5-8 FG, 12-20 FT), 18 boards and three steals in a 105-83 win vs. Golden State (12/6/13) … posted 20 points (6-12 FG, 8-14 FT), 22 rebounds (8 offensive), three assists, three blocks and two steals vs. Orlando (12/8/13), becoming the first Rockets player to post a 20-20 game since Luis Scola on 3/6/10 at Minnesota (25 pts., 21 rebs.) … also became the first Rockets player since Ralph Sampson in 1985-86 to pull down 18 or more rebounds in three consecutive games … topped the Rockets with 32 points (14-22 FG), 17 rebounds and three blocks at Portland (12/12/13) … netted 18 points (5-6 FG, 1-1 3FG) at Golden State (12/13/13), going a perfect 7-for-7 from the stripe for the second most free throws made without a miss in his career (8-8 FT on 3/2/05 vs. Sacramento) … scored a season-high 35 points (13-18 FG, 9-14 FT), grabbed 19 boards, dished five assists and had three blocks in leading the Rockets to a 114-97 win at Detroit (12/21/13) … registered 15 points (7-12 FG) and a game-high 20 rebounds in a 111-98 win at San Antonio (12/25/13) … posted 20 points (5-14 FG) behind a 10-of-24 outing from the stripe in a 113-99 win vs. the L.A. Lakers (1/8/14), adding 13 rebounds, a season-best four steals, three assists and one block … became the first Rockets player to ever attempt at least 24 free throws in two separate games within a single season … led the Rockets with 32 points (11-17 FG, 10-18 FT) and 11 rebounds in a 104-92 win at Boston (1/13/14) … posted 20 points (8-11 FG) and 14 rebounds vs. Milwaukee (1/18/14), including his second 3-pointer of the season (1-1 3FG) … topped Houston with 23 points (5-15 FG) and 16 rebounds in a 97-90 win vs. San Antonio (1/28/14), while making 13-of-25 free throws … notched a game-high 34 points (11-17 FG, 12-18 FT), 14 boards, three steals and two blocks in a 122-108 win vs. Phoenix (2/5/14) … topped Houston in points (27), rebounds (13) and assists (5) in a 101- 95 win at Milwaukee (2/8/14) … in his return trip to Los Angeles to face the Lakers (2/19/14), posted 20 points (9-14 FG), a game-high 13 rebounds and three blocks in a 134-108 win … made 21 rebounds and four blocks at Golden State (2/20/14) … marked his fifth 20-rebound game of the season (67 career) … led the Rockets with 22 points (8-13 FG, 6-8 FT) and a game-high 16 rebounds in a 106-103 win vs. Miami (3/4/14), forcing a missed 3-pointer by LeBron James as time expired … became the first Rockets player to reach 40 double-doubles in a season since Charles Barkley (42) in 1997-98 … posted 21 points (9-12 FG), 14 boards, five assists and two blocks at Miami (3/16/14) … recorded his 47th double-double of the season vs. the San Antonio Spurs (4/14/14) pouring in 20 points (9-11 FG, 2-2 FT) and grabbing 17 rebounds. 2012-13: Named to the 2012-13 All-NBA Third Team … appeared in 76 games (76 starts) with the L.A. Lakers, averaging 17.1 points, 12.4 rebounds, 1.11 steals and 2.45 blocks in 35.8 minutes per outing … missed six games with a torn labrum in his right shoulder (1/8/13-1/11/13; 2/1/13-2/5/13) … ranked among league leaders in scoring (27th/17.1 ppg), rebounds (1st/12.4 rpg), field goal percentage (2nd/.578), blocks (5th/2.45 bpg) and minutes (23rd/35.8 mpg) … scored 20-plus points 27 times, including three 30-point performances … posted 48 double-doubles and one 20-20 game … grabbed 10-plus rebounds 54 times and 20 or more boards four times … voted a starter for the Western Conference All-Star Team (sixth straight start and seventh overall All-Star appearance) … totaled 33 points, 14 rebounds and a season-high five assists at Portland (10/31/12) … had 28 points and 13 boards vs. Houston (11/18/12) … posted 28 points and 20 rebounds vs. Denver (11/30/12) … tallied 19 points and 20 boards at Cleveland (12/11/12) … registered 14 points, a career-high-tying 26 rebounds and four blocks vs. Denver (1/6/13) … notched 31 points, 16 rebounds and four blocks vs. Milwaukee (1/15/13) … collected 24 points, four blocks and a career-high-tying five steals vs. New Orleans (1/29/13) … recorded 24 points, 13 rebounds and five blocks vs. Toronto (3/8/13) … totaled 16 points and 21 boards vs. Chicago (3/10/13) … posted a season-high 39 points and 16 rebounds in his return to Orlando (3/12/13), recording a Lakers franchise-record 25 free throws made (fourth highest FTM total in NBA history) on an NBA record-tying 39 free throw attempts … registered 25 points, 16 rebounds, a career-high-tying five steals and five blocks at Minnesota (3/27/13), becoming just the fourth NBA player ever to record at least 25 points, 15 boards, five thefts and five blocks in a single game … tallied 24 points, 15 rebounds and another five blocks at Sacramento (3/30/13) … finished with 16 points and 18 rebounds vs. Houston (4/17/13) to become the youngest player ever to record 9,000 rebounds in NBA history (27 years, 130 days), surpassing Wilt Chamberlain (27 years, 144 days old) and Bill Russell (27 years, 357 days). 2011-12: All-NBA First Team for the fifth consecutive season ... Selected to the NBA’s All-Defensive First Team for the fourth straight time ... Named a 2012 NBA All-Star starter: sixth consecutive appearance and fifth straight time voted a starter ... Led all players with 1,600,390 votes ... Appeared in 54 games (all starts) with Orlando, averaging 20.6 points, an NBA-high 14.5 rebounds, 1.9 assists, 1.50 steals and 2.15 blocks in 38.3 minutes ... Led the NBA in rebounding while ranking second in FG percentage (.573 (416-726)), third in blocked shots and fifth in minutes played ... Named NBA’s Eastern Conference Player of the Week for the week ending Jan. 22 (19.5 ppg., 18.8 rpg., 2.8 apg., 2.8 blkpg.) ... Led (or tied) team in scoring 27 times, in rebounding 49 times and in assists four times ... Scored in double figures 51 times, had 20+ points 27 times and 30+ points five times ... Scored a career-high tying 45 points on 1/12 at Golden State while setting an NBA record for most free throws attempted in a regular season game with 39 FTAs (21-39, previous record was 34, Wilt Chamberlain (PHI) on Feb. 22, 1962 vs. St. Louis) ... Became the Magic’s all-time leading scorer 1/24 at Indiana following a dunk with 9:59 left in the third quarter, passing Nick Anderson (10,650 points) ... Finished second in the NBA with 43 double-doubles, including nine 20-point/20 rebound efforts ... Recorded double figures in rebounding 44 times and 20+ rebounds nine times ... Grabbed a season-high 25 rebounds 1/18 vs. San Antonio and again 3/13 vs. Miami ... Recorded two-or-more blocked shots 35 times and three-or-more blocks 19 times ... Blocked a season-high eight shots 2/3 vs. Cleveland ... Tallied two-or-more steals 22 times, including a career-high tying five steals 1/2 at Detroit ... Missed 12 games due to injury – missed four games (Apr. 1-3, 9-10) due to back spasms, then missed eight games (Apr. 13-26) due to a herniated disc in his lower back ... Underwent surgery 4/20, missing the 2012 NBA Playoffs due to the procedure. 2010-11: All-NBA First Team for the fourth straight season…Named NBA Defensive Player of the Year for the third consecutive season, becoming the first player in NBA history to capture the award three straight times…Also selected to the NBA’s All-Defensive First Team for the third straight season…Finished second in voting for NBA Most Valuable Player… Played and started in 78 games with Orlando, averaging a career-and-team high 22.9 ppg., a team-high 14.1 rpg., 1.4 apg., a team-high 2.38 blkpg. and a career-and-team high 1.37 stlpg. 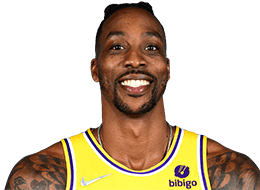 in a team-high 37.6 minpg….Shot a team-high .593 (619-1,044) from the floor…Ranked second in the NBA in rebounding, second in FG percentage, fourth in blocked shots, 11th in scoring, 13th in minutes played and 19th in steals…Named NBA’s Eastern Conference Player of the Month twice - October/November 2010 (21.8 ppg., 12.1 rpg.) and February 2011 (26.6 ppg., 14.8 rpg., 2.00 blkpg., .667 FG pct. )…Named NBA’s Eastern Conference Player of the Week six times – periods ending Nov. 8 (23.3 ppg., 13.4 rpg., 3.67 blkpg. ), Nov. 28 (26.3 ppg., 14.5 rpg. ), Jan. 23 (26.0 ppg., 13.3 rpg. ), Feb. 13 (25.8 ppg., 16.8 rpg. ), Feb. 27 (30.3 ppg., 14.0 rpg., 3.33 blkpg., 2.00 stlpg.) and Mar. 27 (27.3 ppg., 14.3 rpg., 3.33 blkpg., 2.33 stlpg., .711 FG pct. )…Also played and started in six playoff contests, averaging 27.0 ppg., 15.5 rpg. and 1.83 blkpg. in 43.0 minpg….Led (or tied) the team in scoring 55 times and in rebounding 71 times…Scored in double figures 76 times, had 20-plus points 51 times, 30-plus points 16 times and 40-plus points twice, including a season-high 40 points on Jan. 28 @ Chicago and Feb. 25 vs. Oklahoma City…Hit game-winning layup on a putback with 4.0 seconds left on Nov. 27 @ Washington…Had NBA-high 66 double-doubles, including six 20-point/20 rebound efforts – 26 points and 20 boards on Dec. 18 vs. Philadelphia; 26 points and season-high 23 rebounds on Dec. 21 vs. Dallas; 29 points and 20 boards on Jan. 12 @ New Orleans; 20 points and 20 boards (in only three quarters) on Jan. 30 vs. Cleveland; 22 points and 20 rebounds on Feb. 8 vs. L.A. Clippers; 31 points and 22 boards on Mar. 16 @ Milwaukee…Recorded a franchise-record 33 straight double-doubles from Jan. 21-Apr. 1, averaging 24.6 ppg. and 15.6 rpg. during that span…Recorded double figures in rebounding 68 times, 15-plus boards 35 times and 20-plus rebounds eight times, including a season-high 23 rebounds on Dec. 21 vs. Dallas…Had 20-plus rebounds in three consecutive games from Dec. 18-21…Became the youngest player in NBA history to amass 7,000 career rebounds on Mar. 1 vs. New York (25 years, 83 days), passing Wilt Chamberlain (26 years, 128 days)…Tallied 1,000+ rebounds for the sixth consecutive season, the most among all active players in the NBA…Has at least one blocked shot 73 times...Notched two-or-more blocked shots 56 times and three-or-more blocks 29 times, including season-high eight blocks on Nov. 3 vs. Minnesota…Set team record for most blocks in a quarter with six in third quarter on Nov. 3 vs. Minnesota…Tallied at least one steal 58 times…Has two-or-more steals 34 times, including a season-best four steals four times, last on Apr. 13 vs. Indiana…2011 NBA All-Star: Fifth consecutive appearance and fourth straight time voted a starter…Led all Eastern Conference players (and second-most overall) with 2,099,024 votes…Had five points, seven rebounds, one assist and one steal in 21 minutes…Scored 10,000th career NBA regular season point on Mar. 13 @ Phoenix, becoming the fifth-youngest player in NBA history (25 years, 95 days)…Appeared in 500th career NBA regular season game on Nov. 18 vs. Phoenix…Recorded 500th career steal on Feb. 8 vs. L.A. Clippers…Passed Pat Garrity (513) for second all-time on Magic’s games played list on Dec. 20 @ Atlanta…Passed Tracy McGrady (452) for fourth all-time on Magic’s career steals list…Passed Anfernee Hardaway (5,380) for fifth all-time on Magic’s career field goals attempted list…Missed two games (Dec. 3-4) due to a stomach virus…Suspended by NBA on Mar. 7 after receiving his 16th technical foul on Mar. 4 vs. Chicago and on Apr. 10 after receiving his 18th technical foul…Poured in a playoff career-high 46 points on Apr. 16 vs. Atlanta. 2004-05: Unanimous selection to the NBA’s All-Rookie First Team…Finished third in voting for NBA Rookie of the Year…Played and started in all 82 games for Orlando, averaging 12.0 ppg., team-high 10.0 rpg. and a team-best 1.66 blkpg. in 32.6 minpg.…One of only eight players in the NBA to average a double-double and the first rookie (along with Charlotte’s Emeka Okafor) to average a double-double since Shaquille O’Neal and Alonzo Mourning accomplished the feat in 1992-93…Became the first player in NBA history directly out of high school to start in all 82 games during his rookie season…One of only 11 NBA players to start in all 82 games…Shot a team-leading .520 (352-677) from the field…Ranked eighth in the NBA in rebounding, 10th in FG percentage and 19th in blocked shots…Ranked among all NBA rookies in scoring (3rd), rebounding (2nd), FG percentage (4th), steals (6th), blocked shots (3rd) and minutes played (3rd)…Led (or tied) the team in rebounding a team-best 55 times…Recorded double figures in rebounding 43 times, including 20 rebounds three times…Became the youngest player in NBA history with 20-plus boards in a game on Dec. 1 vs. Toronto…Also had 20 rebounds on Feb. 10 vs. Atlanta, becoming the first rookie since Tim Duncan in 1997-98 with multiple 20-plus rebound games in a rookie season, and on Mar. 9 @ Toronto…Became first NBA rookie since 1991-92 (Shaquille O’Neal, 1992-93, 12 games) to record 10-plus rebounds in first nine regular season games of his career…Led (or tied) the team in scoring six times…Scored in double figures 51 times, including 20-plus points in 11 games…Had team-high 32 double-doubles…Had at least one blocked shot 68 times and had two-or-more blocks in 39 games…Had at least one steal in 48 games, including career-high four steals three times, the last on Apr. 1 vs. Washington…Participated in 2005 got Milk? Rookie Challenge at NBA All-Star Weekend…Tallied 14 points, five rebounds, one assist, a game-high three blocks and one steal in 19 minutes…Made NBA regular season debut with start on Nov. 3 vs. Milwaukee and tallied 12 points, a game-high-tying 10 rebounds, two assists, four blocks and three steals in 38 minutes. Selected by Orlando in the first round (first overall) of the 2004 NBA Draft…Signed a contract extension with Orlando (Jul. 12, 2007) ... Traded from Orlando to the Los Angeles Lakers as part of a four-team trade on Aug. 10, 2012 ... Signed as a free agent with the Houston Rockets on July 13, 2013. Finished career at Southwest Atlanta Christian Academy with 2,146 points, 1,728 rebounds and 811 blocked shots in 129 games (16.6 ppg., 13.4 rpg., 6.29 blkpg. )…Winner of the 2004 Naismith Award, signifying the nation’s top high school player…Also captured the Morgan Wooten High School Player of the Year Award, the Gatorade National Player of the Year Award and the McDonald’s National High School Player of the Year honor…Named to the PARADE Magazine All-American Team…Earned Co-MVP of the 2004 McDonald’s High School All-American game…Played in the EA Sports Roundball Classic (16 points, 12 rebounds, six assists, three blocks) and the Jordan Capital Classic (18 points, 15 rebounds, six blocks)…Named Mr. Basketball in the state of Georgia in 2004…Led SACA to the Class A Georgia state championship as a senior (2003-04), after averaging 25.0 ppg., 18.0 rpg., 3.5 apg. and 8.0 blkpg.…During his junior season (2002-03), averaged 20.0 ppg., 15.5 rpg. and 4.5 blkpg., while leading SACA to a 30-3 record and a runner-up finish in the state’s Class A division. Full name is Dwight David Howard…Father, Dwight Sr., is a Georgia State trooper and serves as Athletic Director of Southwest Atlanta Christian Academy…Mother, Sheryl, played on the inaugural women’s team at Morris Brown College…Recognized for his tremendous efforts in the Central Florida community with the Rich and Helen DeVos Community Enrichment Awards a franchise-record five times, including the last four seasons (2005, 2008-11)…Received the NBA Community Assist award three times (July 2007, January 2009, October 2010)…Served as a spokesperson for the NBA Fit program to raise awareness of physical fitness and nutrition to fight childhood obesity…Established the D12 Foundation in 2011 (www.d12foundation.org)…Donated $17,500 to the Pine Hills Boys & Girls Club for new computers, televisions and furniture in the summer of 2007…Helped create a state-of-the-art game room designed especially for teenagers at the Florida Hospital for Children…Provided an initial $30,000 to fund the new room, which features the latest in videogame technology, movies, board games, and education resources to provide young patients undergoing difficult medical treatment with a place to relax and have fun…Launched dwighthoward.com in 2009…Holds an annual father/son basketball clinic during the summer in his hometown of Atlanta…Has also taken on a mentorship role with a young boy he met at his camp, routinely speaking and working with him…Donated 300 pairs of shoes to the students at Orange Center Elementary School for their hard work towards improving their FCATs…Hosted a prayer breakfast for 150 Central Florida high school students…Spent part of summer 2005 in Manila as part of NBA Madness, an interactive basketball lifestyle event for fans…Helped build a playground in the Central Florida community…Also participated in ABC’s Extreme Makeover: Home Edition for local family…Key speaker at Magic’s Faith & Family Nights…Active in Magic’s Read To Achieve program by taping books for kids to hear on Magic’s Storyline…Favorite movies are Finding Nemo and Friday…Wrote several goals down while in the eighth grade – among those were to lead his team to a state championship and to become the first overall selection in the NBA Draft…Favorite players are Michael Jordan and Kevin Garnett…Traveled to India in summer of 2010 to participate in a series of events to further the growth of basketball and the NBA in the world’s second-largest nation…Also toured China and Taiwan in support of the Amway Nutrilite Junior NBA challenge, a developmental program for children ages 7-12.